C'mon over, we Tabbies are at it again. Today is the "Caption This" event. It's big time FUN! I have mine up. It is fun. So much fun over there! Mom is wiping her eyes but she's laughing! Silly Mom! OMC! How fun was that? Thanks for coming to visit. Charlotte is our long term foster kitty and she doesn't have many visitors. 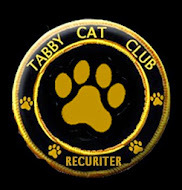 I am on my way to the Tabby Club now.